Review: The Refuge | eat. write. smile. 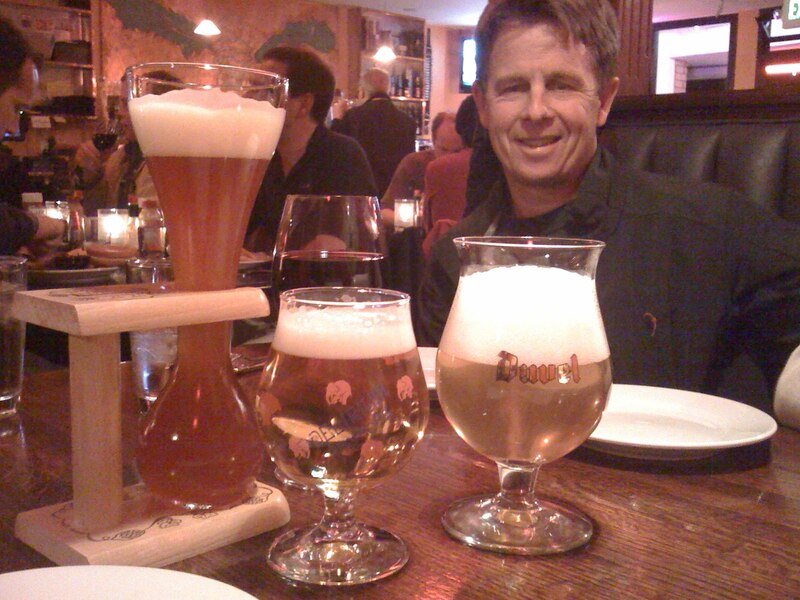 Did you know there was a happening Belgian gastropub in San Carlos? That’s right, San Carlos. I didn’t know, but I was lucky enough to go there a few weeks ago with my close friend Christie, and her parents Mark and Cindy Ginanni. We had a blast. I have to preface this restaurant review with a note about the Ginannis. Everyone has that friend that can sniff out a good time, knows where to find the goods, always knows “some guy” who can hook it up. The Ginanni family has this role down pat. Are you thinking about taking a vacation in Italy/Germany/Mexico? Mark and Cindy know a count who is just dying to host you at his villa. Looking for something to do on a quiet Monday night? The Ginannis are hosting a pizza party around their backyard wood-fired oven. You have got to come drink wine and toss dough. We once went to the beach in Half Moon Bay but we were met with cloudy, freezing weather. Instead of being bummed out, we used kelp for a jump rope and snapped perfect candid shots while laughing our asses off. I could go on forever, but I won’t because this blog is supposed to be about food. The point is- the Ginannis are people who got the joie de vivre memo and they encounter great food and experiences because of it. Thus it was no surprise that they were the ones to introduce me to Refuge, a gem of a spot on a slightly random residential street in San Carlos. Refuge makes no bones about their primary purpose in life: to serve good beer. They have a beer list that puts most restaurants’ wine lists to shame in terms of size and variety. 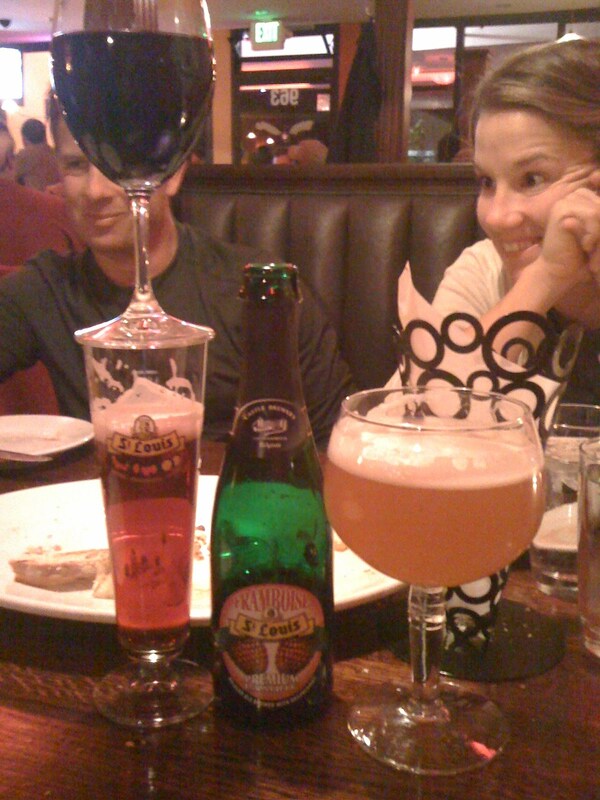 My two favorite Belgian beers are Delirium Tremens and Duvel, and Refuge had these two plus many more I had never seen. I also love raspberry beer (I know, I’m a girl), so I couldn’t pass on the St. Louis Framboise Lambic. Whether you’re looking for a dark, chocolate-looking beer, or something fruity, Refuge pours your beer any way you like it. While I’m not arguing that beer drinking as an activity needed improvement, Refuge sure adds a little fun with the different shaped beer-specific glasses. 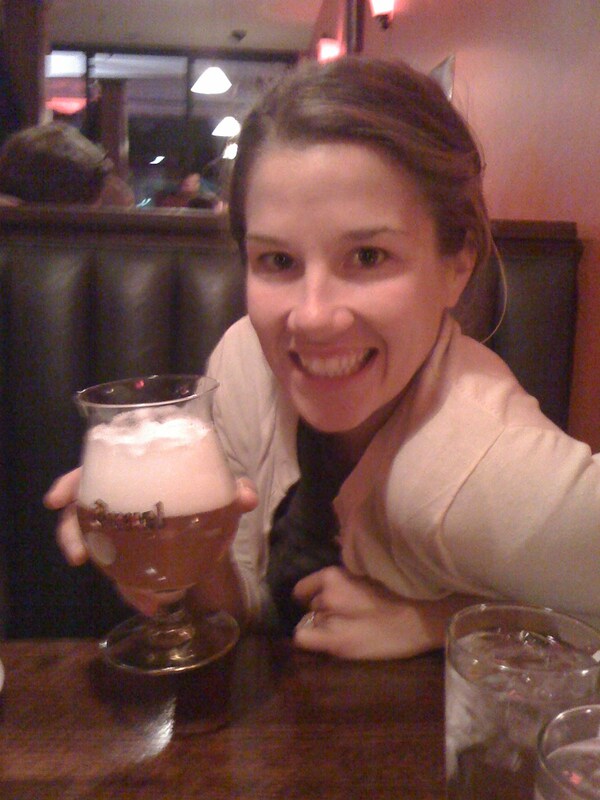 Cindy ordered the beer Kwak only because it is served in a narrow beaker with a wooden coachman’s handle. It’s brilliant marketing by the Belgian beer makers. Why not have another beer? I want to see what kind of glass will accompany it! The food at Refuge is the perfect complement to its beer-loving identity. We ordered the charcuterie platter, which comes in several sizes. We picked nine items (but you can pick any number you like) from their list of house-made sausages, salamis, and a variety of cheeses. 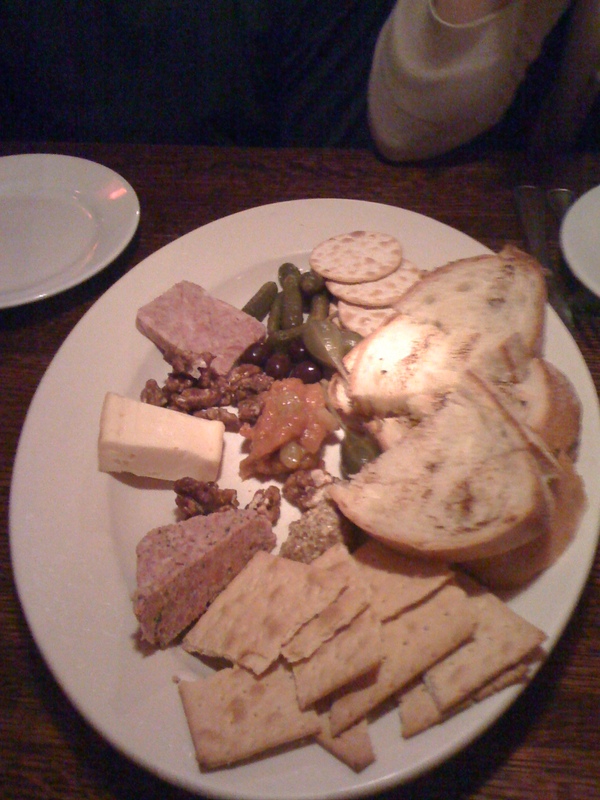 Our obliging server returned with a plate piled so high, we could barely see each other over the slices of crusty bread, the candied nuts, the apricot compote, and the country paté. Or was my vision going because Delirium Tremens is 10% alcohol by volume? Nah. Also, the headier Belgian beers pair perfectly with cheese; I loved the creamy Explorateur cheese, while Christie favored the Chimay Grand Cru. Don’t miss either of them if they are still offered on the menu. For my Bay Area friends who are tired of eating in downtown Palo Alto or the Marina in San Francisco, Refuge is a more-than-worthy alternative. The list of beers alone is reason enough to go; their delicious food is a bonus. If you’re lucky, you’ll see Mark and Cindy, or some other member of the Ginanni clan, and soon you’ll be smiling at ridiculous glass arrangements like this one below and laughing so hard you’ll want to write about it nearly a month later. This entry was posted on December 8, 2009 by Ruthie in Uncategorized.